Today is National Bike to Work day, which reminds me of my early days in Las Vegas. The first couple months of working at the Review-Journal were spent commuting about 5 miles each way to work. Then winter came, and I got out of the habit. That was back in 2012. I'd still jump back on the saddle now and again until May 2016 when my office moved to a different area of town - around 13 or so miles from my apartment. That's a little too long of a commute for me. Since I'm not commuting by bike today, here are 5 reasons why I miss it. Ride away the stress of the day. The past few weeks have been pretty crazy and stressful at work. So many little things are cropping up, that end up annoying me a lot more than they probably should. Then I get home and don't feel like doing anything. And am sometimes in a crappy mood to boot. Getting the adrenaline pumping while commuting home puts things into perspective and helps wash away some of that stress. I miss coming home feeling physically drained but emotionally energized. Also, vegging on the couch is totally guilt-free after bike commuting. The price of gas in Las Vegas right is well over $3/gallon. That's crazy! I had to google the current price, because I just pump it and never really pay attention to the cost. It's a necessity, after all. When you commute by car, gas is just something you need to buy. Saving gas isn't just good for the ole pocketbook, it's also good for the environment and helping keep our air clean which keeps us healthy. Wins all around!! Reflecting back on her time as a #bikecommuter, @EnjoytheCourse is sharing what she misses about no longer being able to ride her bike to work. It may seem weird, but the more you bike commute, the better a driver you become. When you're used to dealing with traffic as a cyclist, it's just natural to become more aware of what else is going on around you when you find yourself driving in a car. You'll be more apt to watch for cyclists, walkers/runners, and, of course, other drivers. I'll admit that sometimes as a driver, I don't always pay the best attention to everything going on. I'm certainly not the worst driver, but I've definitely let some of observation skills slide now that I no longer bike commute. Don't try to deny it. As runners, cyclists, triathletes, a lot of what we do is for bragging rights. We like to tell people we're training for this or that. We show off our medals. C'mon, we brag. Admit it. I loved that about bike commuting. My coworkers were always super impressed that I would take the time and effort to bike into work. The more you burn, the more you can consume, right?! Honestly, though, when I was regularly bike commuting, I did eat a lot more, but I also craved healthier, better energy burning snacks. All this reflecting back about biking to work has really made it wonder, could I occasionally bike to work? Truth be told, I haven't been on my bike at all in a few months. I really want to get back to it, and yes, part of me wants to work up to being comfortable enough to commute 26 miles in a day. Not every day, but maybe a few times a month. Did you bike to work today? 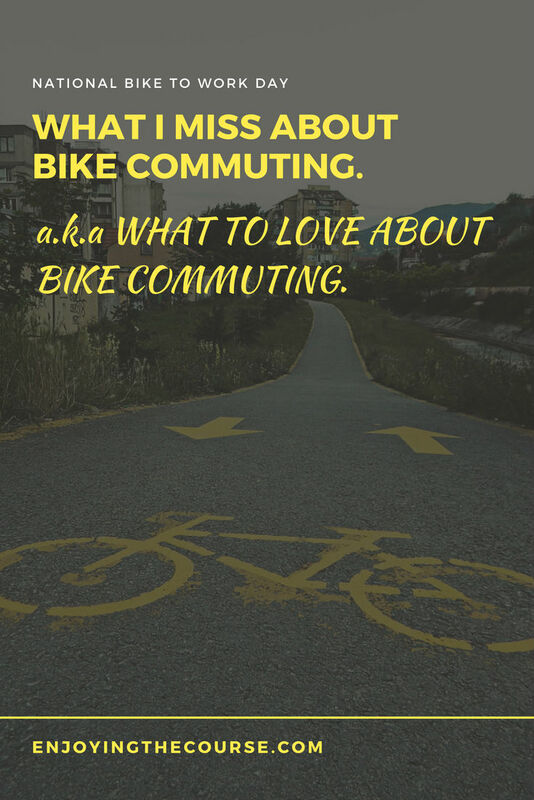 Have you ever bike commuted? Would any of these reasons sway you to try bike commuting? What's something you used to do a lot but now rarely do?